The New England Patriots are in an interesting spot this offseason. While their biggest needs are on defense, they do have multiple young players on that side of the football who – New England hopes – have yet to reach their ceiling. For example, linebacker Elandon Roberts and edge defender Deatrich Wise have been featured heavily but have been unable to produce at a consistent level. In addition, veteran linebacker Dont’a Hightower and edge defender Derek Rivers are both coming off season-ending injuries that might impact their level of play in 2018. Although it has not been always the case, the Patriots have recently surrounded quarterback Tom Brady with young talented players on offense, highlighted by New England’s young interior offensive line. While tight end Rob Gronkowski has been mulling retirement, he is under contract so for the purposes of this article we assume that the NFL’s best tight end will be back with New England for the 2018 season. 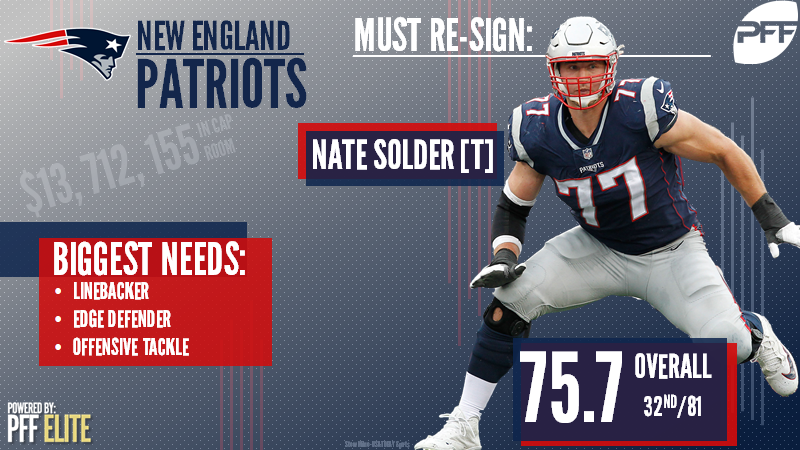 While a case can be made that Solder is just the third best free agent on New England’s offense behind running back Dion Lewis and wide receiver Danny Amendola, his positional value and lack of alternative options should force the Patriots to re-sign the veteran. Not only is Solder an unrestricted free agent, but backup swing tackles Cameron Fleming and LaAdrian Waddle’s contracts are also up, which leaves the Patriots with just one player – right tackle Marcus Cannon – who has already played an NFL snap at offensive tackle. Admittedly, Solder has been among the more inconsistent tackles in the NFL as he can have both hot and cold streaks featuring boom or bust games. However, he was able to put together very solid couple months in 2018 and was among the league’s best offensive tackles after the Patriots’ bye week in Week 9. New England’s inability to stop the run and their linebackers failing to come off blocks hurt the Patriots all season. Williamson earned the sixth-highest run-defense grade among linebackers with an elite grade of 90.1, while no New England linebacker managed to record a run-defense grade higher than 44.0. In addition, Williamson recorded a defensive stop on 8.8 percent of run plays when he was on the field, which ranked 25th among linebackers. On the other hand, Roberts made a stop on just 6.2 percent of run plays, which was dead last among linebackers. As of now it is unknown where New England intends to play Hightower in the future as he has been moved to more of an edge defender role over the last two seasons. However, if that development continues and Hightower does not return to the middle of the field, Williamson – who is still only 26 – could be a worthy successor. Okafor is coming off a season-ending injury after signing a one-year deal with the Saints and enjoyed a breakout season until he tore his Achilles. This makes him a prime candidate to sign another one-year deal, which Bill Belichick has been famous for offering to veteran contributors. Okafor can help the Patriots’ pass-rush, a unit that struggled mightily in 2017, while he can also contribute in run defense. In addition, Okafor would not need to necessarily play a big role after recovering from his injury as he could split time with second-year players in Rivers and Wise. The Patriots’ plans in the secondary rely heavily on what they envision cornerback Eric Rowe doing in 2018. Rowe played most of his snaps in the slot in 2017, however, he replaced Malcolm Butler in the Super Bowl and played on the outside where he did have some success after initial struggles. With that in mind, New England might target a slot cornerback or outside cornerback depending on where they intend to use Rowe next season. Acquiring Amukamara would allow Rowe to move back to the slot as the Bears cornerback plays exclusively on the outside. Amukamara allowed only one touchdown all season despite seeing 51 targets in 2017. Furthermore, he has been solid tackler over the past two seasons as he missed just a total of five tackles in 2016 and 2017, which is an important skill in Belichick’s defense.